Thinking of Lasik? Think about Gentle Vision Shaping System (GVSS). This is a non-surgical alternative to laser surgery to help reduce nearsightedness. GVSS is the process of reshaping the cornea of the eye to reduce nearsightedness. The older sister of this procedure was known as “orthokeratology,” which has been around since the early 1960s. 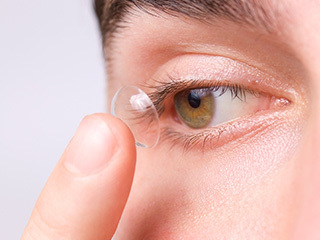 These first lenses, which were made of plastic, were worn during the day to reshape the cornea so that the amount of nearsightedness became decreased so the individual could function for short periods of time with either no correction or a lesser amount of correction. These lenses are designed to be worn at night while you sleep. While sleeping, the lenses gently reshape and flatten the cornea, which reduces the nearsightedness of the eye. The speed and amount of reduction in nearsightedness depends on the amount of nearsightedness a patient initially has. After maximum correction has been achieved, a retainer lens needs to be worn at night to maintain maximum effect. If one decides that the resulting change in vision is not what was anticipated, then one can quit wearing the lenses and vision will return to the previous state. The doctors of Valley Vision Clinic are specially trained and certified in GVSS and are happy to answer your questions about the procedure. You can also visit www.paragoncrt.com for more information about GVSS. Many patients with vision problems heartily embrace the idea of enjoying vision correction without having to wear eyeglasses or contact lenses. Not all of these patients, however, are good candidates for PRK or Lasik surgery, the two standard surgeries used to alter the way the cornea of the eye refracts light. If that describes you, don't fret -- because here at Valley Vision, we offer an advanced corneal reshaping technique known as orthokeratology, or Ortho-K. This non-surgical technique can produce changes to the way your cornea refracts light. Some of our patients simply don't like the idea of any kind of surgery, or they want a reversible procedure. Orthokeratology may be an ideal choice for these individuals. Dr. Schaff will map the shape of your corneas precisely and then fabricate special contact lenses. Unlike standard contacts, you'll wear these lenses at night. The lenses perform a subtle corneal reshaping as you sleep, meaning that you can take them out the next morning and enjoy perfect or near-perfect vision.